Since the festive season is almost upon us, we’ve gathered together the twelve most interesting literature-related facts about Christmas that we could find. So here they are, ‘The Twelve Facts of Christmas’ … with a literary link. We hope you like them. 1. Christina Rossetti wrote the words to the Christmas carol ‘In the Bleak Midwinter’. Rossetti (1830-94) is regarded as one of the finest nineteenth-century female poets. Rossetti wrote the words to the carol during the mid-nineteenth century, but it only became a musical piece in the early twentieth century. The first musical accompaniment for Rossetti’s carol was the work of none other than Gustav Holst, the British composer most famous for the Planets suite. 2. Poet Nahum Tate wrote the words for ‘While Shepherds Watched Their Flocks’. Tate (1652-1715) was also the man who rewrote Shakespeare’s King Lear to give it a happy ending, although he is now probably more famous for penning the words to this popular carol. Tate was also one of the first people to hold the official post of Poet Laureate in Britain, between 1692 and 1715, and he wrote the words to Henry Purcell’s famous opera Dido and Aeneas. 3. Washington Irving arguably did more for Christmas than Charles Dickens did. Although we often talk about Dickens (1812-70) as the one who helped to popularise and rejuvenate Christmas as a time of festivity, through his celebrated 1843 book A Christmas Carol, Dickens himself was highly influenced by Irving (1783-1859), the American writer of fairy tales such as ‘Sleepy Hollow’ and ‘Rip van Winkle’. Irving helped to inspire the modern American notion of Christmas, drawing on traditional English Christmas celebrations that had, at the time, fallen out of fashion on both sides of the Atlantic. 5. There is a species of snail called Ba humbugi. The Fijian snail is named after Scrooge’s famous exclamation in A Christmas Carol, although Scrooge only utters the words ‘Bah, humbug!’ twice in the whole story (though he exclaims ‘Humbug!’ a number of times). 6. The words to ‘Once in Royal David’s City’ were written by the same person who wrote the hymn ‘All Things Bright and Beautiful’. Her name was Mrs Cecil Alexander, and her version of ‘All Things Bright’ is but one of several (although it is the most famous). 7. Much of our modern idea of Santa Claus comes from the 1823 poem ‘A Visit from St Nicholas’. More commonly known by its first line, ‘’Twas the night before Christmas’, this poem popularised the image of St Nick as a jolly fat man wearing fur-trimmed red robes (long before the Coca-Cola adverts popularised the red robes). The poem also introduced us to the names of all of Santa’s reindeer. It was published anonymously, and probably written by an American professor called Clement Clarke Moore – although this claim has been disputed by some. 8. ‘Father Christmas’ first appears in a play by Ben Jonson. The term ‘Father Christmas’ – used to refer to the personification of the festive season, a bit like ‘Old Father Time’ – originates in a 1616 masque (a festive play for performance at royal courts) by Shakespeare’s contemporary, playwright and poet Ben Jonson. Christmas, His Masque features ‘Christmas’, attended by all ten of his children, whose names include Carol, Wassail, Misrule, and Minced-Pie. 9. T. S. Eliot’s poem ‘Journey of the Magi’ was originally commissioned to be included in a Christmas card. Eliot’s poem about the Magi’s journey to visit the infant Christ was written rapidly in an afternoon, at the request of his publisher, Faber and Faber, who wanted a poem to go inside a series of shilling greeting-cards known as Ariel Poems. The first five lines of Eliot’s 1927 poem are ‘borrowed’ from a Christmas sermon given by Lancelot Andrewes (1555-1626), one of the key translators of the King James Bible and a considerable influence on Eliot (who had become an Anglo-Catholic earlier in the same year). 11. The earliest known use of the phrase ‘Christmas present’ is from a 1663 entry in the diary of Samuel Pepys. Pepys recorded in February of that year: ‘I was told that my Lady Castlemaine had all the King’s Christmas presents made him by the Peeres given to her.’ Contrary to a popular misconception, Pepys didn’t write his diary in cipher: it was penned in a form of shorthand of the day known as tachygraphy (literally ‘swift writing’), and Pepys took steps to preserve the diary for posterity, suggesting that, whilst it was meant to be a personal account of his life, he did not choose to write the diary in ‘code’ as such and intended others to read it. 12. Between 1920 and 1942, J. R. R. Tolkien, author of The Hobbit, wrote a series of letters to his children from ‘Father Christmas’. The Father Christmas Letters were published posthumously in 1976 and have been linked to Tolkien’s major work, The Hobbit and The Lord of the Rings. 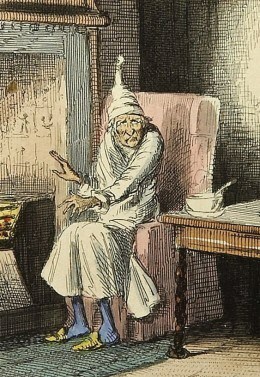 Some scholars – such as Laurence and Martha Krieg in the journal Mythlore – have even suggested that the character of Gandalf was partly inspired by the figure of Father Christmas. If you enjoyed those Christmas-themed literary facts, check out our list of fantastic festive facts. You might also enjoy our compilation of great poems for Christmas. Fascinating factoids, interesting … may I call you ‘interesting’? I really enjoyed this. Glad you like the post, Angela! Thanks so much for the comment. Fantastic post for the festive season! Great post…very informative. What do you think of the notion that Coca Cola popularized Santa Claus? As for Coca-Cola – Sundblom’s ads certainly helped to give Santa a boost, and their TV ads are always joyous. Mind you, I love Moore’s poem too (if it was Moore who wrote it). Thanks, you’re fabulous – a ringing endorsement! Much appreciated!! Wow! Thanks Russell… Will have to take a look at that award. Much appreciated! Fascinating post – I’m so glad I just found this blog! Thanks, and my pleasure – I love your post about Christmas and the supernatural, a fascinating subject. I’ve just published a book on ghost stories and discuss Henry James in it, so I found what you said particularly interesting and perceptive! Very stimulating miscellany: very much liking these posts! The snail reference made my day. So perfect for Scrooge, at least until his transformation. Only a new oyster or clam would have been better. Dickens does name a tribe of civil servants who see their duty as obstructing any progress as the Barnacles in another book.